Learn how to draw a book in this step by step book drawing for beginners tutorial where we will teach you how to draw a book standing up, a book cover, an open book and more. Welcome doodlers to another drawing tutorial, this time we will have fun with books. Some time ago I sent a bool doodle tutorial to my subscribers at Happy Doodle Club and when some of them replied saying how they enjoyed that week’s doodles I thought to make a few more for everyone here. Book doodles are really useful for school or college book decoration but also if you like to have a bullet journal books to read tracker! But regardless of the way that you will use these drawings, book doodles are always fun to make! So follow along and let’s learn how to draw a book in a variety of angles. Want to know how to draw even more doodles? Check out our huge list of step by step doodle tutorials! Find below our easy step by step book drawing tutorials. The reason why I like to use my Micron drawing pen for doodles like this is because this brand uses archival ink in their pens, meaning that the they don’t bleed through paper (therefore safe to use in bullet journals) and are waterproof! So if you like to use watercolors to color your image after you doodle, these pens won’t smudge! My guide for best bullet journal pens can be found here! Start with a basic rectangle. I like to put mine on a slant for a little interest. Add the spine, remembering to add a slight curve at both the top and bottom of the spine. Next add a line for the back of the book that is parallel to the front cover. Add a few curved lines along the spine of the book for detail. Lastly add your title (make this whatever you like) and a few lines for the pages of the book. The first step is to draw a horseshoe shape. You will want this on an angle. Next draw a slim rectangle for the spine, remembering the curves at top. Then draw another rectangle for the book cover. Lastly add the details such as book title, spine detail and pages. Draw a set of lines that will eventually be the book spines. 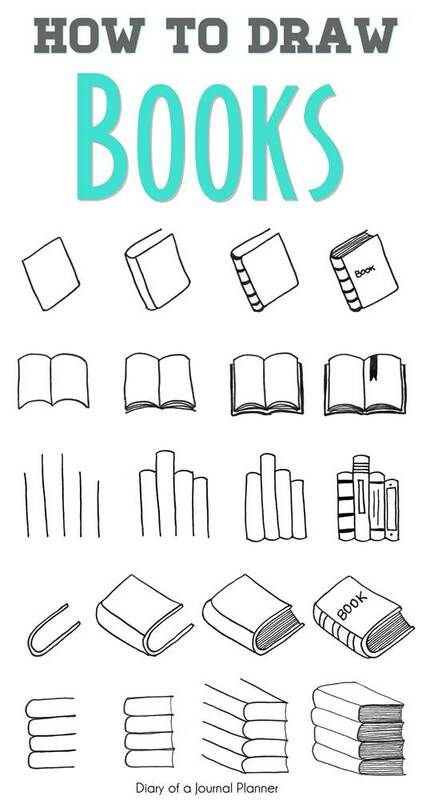 Make sure they are different heights for interest and that you will be sharing one line for the spines of two books. Next add the small curved lines that will be the top of the books. Do the same for the bottom of each book. Finally add details for the spines of the books. You can add shapes, lines and even titles. An open book looks a little more complicated but it is just as simple. Draw a line for the centre of the book and create two rectangles from this. Make the top and bottom lines curved so you get the effect of an open book. Draw a few small lines at the bottom of the pages to represent pages. Next draw the front and back covers. This is just a large rectangle set behind the doodles you have already made. I like to darken the edges a little to make it stand out. Finally add a cute bookmark. Decide how many books you would like in your stack and starting from the bottom draw a elongated U on its side. Then repeat this for the number of books you want. Do a slightly indented line at the top of each U to represent the pages. Next are the covers and spine. For the top book you will need three lines. Two coming from the curve of the U for the spine and one from the top for the book cover. Next draw the remaining spine lines. The last step is to draw the tops of these spines with a curved line and the top of the book cover on the top stacked book. Draw a few lines to make the pages of the books and you are finished. 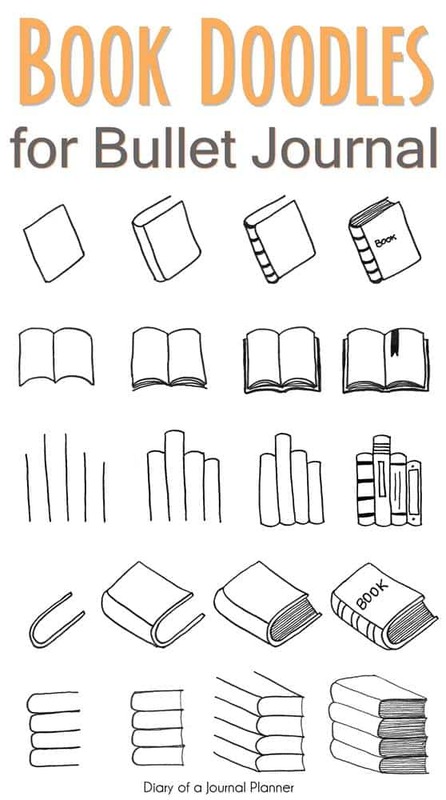 Want to learn how to make these book doodles a free printable pdf template as well as other doodle tutorials? Then subscribe to my Happy Doodle Club! In the club you will have access to these drawing templates and lots of other easy doodles and receive new doodles every week on your inbox. I have made it super simple to print and practice as much as you would like! Join now!